"Water, water everywhere but not a drop to drink." That's a line from an old salt's tale of a sailing ship traveling across the Atlantic headed for the new world on the other side. Seems the ship got lost. They ran out of fresh water and the crew feared they would die. As luck would have it, they spied another ship crossing the horizon. They hailed the ship and communicated their desperate need for water. The reply came back, "Throw down your buckets!" It seemed like a ridiculous reply, but they threw down their buckets over the side into the sea. Well, if you know this story, then you also know they cranked in pails full of fresh water. Seemed odd until the explanation came that the ship was sitting in a current of fresh water pushed way out to sea beyond sight of land by the mighty Amazon River. "A cool story," you say "but what's it got to do with fishing?" Well, I was just reading an article in a national bass publication about how three nationally-known bass superstars fish crankbaits. Each pro gave all kinds of complex and excruciating details about some totally different and advanced way to crankbait. No two of the three pros mentioned anything remotely close to what the others said. One guy won a big tourney his way, the other guy won another tourney a totally opposite way, and the third pro did it his way. As far as me the reader trying to pull in a fresh pail full of clear crankbaiting know-how, I felt like I was lost in an endless sea of information I just could not drink. I was doomed to die of thirst before I could wring a single drop out of it! That's when I thought of the tale of the old sailing ship. I decided to just throw down a bucket right there. I hope you'll pull in a pail of clear crankbait information below. Please enjoy! Envision your favorite crankbait. It looks just about as obvious as the Goodyear blimp, doesn't it? Now take that blimp and add action - broad sides rolling, bold colors flashing, tail strutting briskly back and forth, head bobbing, bottom-gouging like a mini bulldozer, deflecting up and over every obstruction in its path. 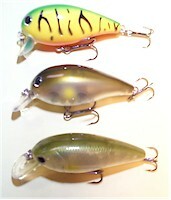 Let me also ask you, "What's your favorite crankbait color?" Is it "fire tiger", a pop art concoction of bright blazing orange, glaring fluorescent green, hot yellow chartreuse with bold black bars and stripes thrown in all over? We're not soaking a skinny, drab-colored pumpkin or watermelon worm here anymore! So that's the first thing about a crankbait - a crankbait makes an obvious target. It's bulbous, billboard-sided, much bulkier and more conspicuously painted than most any other lure in your tackle box. Second, if you can feel a crankbait throbbing in your rod tip from 50 feet away, just imagine what kind of excitement your crankbait's throb ignites in a fish's lateral line! Now crankbaits just assault these two senses - eyesight and the lateral line. All that's built in right out of the box - big bulk, bold color and throbbing vibration. Third, you want a crankbait that casts far. Over the course of a few seasons as you try different ones (hundreds of crankbaits are on the market), keep in mind that castability counts. One that casts well for you because it matches with the rod and reel you use without overpowering it. If a crankbait waffles in the wind, dies and drops short, you don't need it. The farther you can throw a crankbait, the more water you can cover, the more fish you can attract, the deeper it will go and the longer it will be in the strike zone the farther you can cast it. No crankbaits go deeper than that. It's fairly easy to find crankbaits that fit each of these zones. Look at the lip. As a rule of thumb, if the lip is much shorter than an inch and angled vertically, it's going to stay in zone one. If the lip is approximately an inch and angled less than 45 degrees, that's zone two. If the lip is much longer than an inch and practically horizontal, that's zone three. A wide lip usually makes a wide wobble and a lot of rod resistance. A thin lip usually creates a tight wiggle with less resistance. Those are general rules of thumb. Zone 1 crankbaits are usually very buoyant. In zone 1 you will typically encounter weeds, reeds, wood and other kinds of cover - solitary cover or acres of it. Cast into open water beyond the cover and reel the crankbait right up to it. If you think you can bounce off the cover without fouling, hit the crankbait right into the side of it and stop reeling. If you fear getting fouled, just stop reeling an instant before contact. In either case, let the crankbait float up. Most of these zone 1 types are highly buoyant and will bob up to the surface like corks. Then do nothing. Bass will belt them as they rise, and they'll even boil up to swat them off the surface as they float motionless. Repeat as long as there is cover to come through. 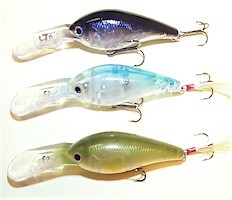 Many zone 2 and zone 3 crankbaits are also very buoyant. In general, these buoyant ones are the best types for digging along bottom. The rod tip is usually held pointing down at an angle that telegraphs a strong throb. Get a good long cast. Hold the rod down. Sweep the tip slowly once or twice to help pump the crank down and reel steadily until the crankbait starts bumping along bottom or pounding into obstructions down there. Pause the retrieve a bit when you start striking into stuff. If it's a troublesome snaggy spot your crankbait's gotten into, lift the rod tip a bit to alleviate line pressure, thereby causing some slack line for the crank to float up. The high buoyancy helps keep you from snagging. Slowly resume reeling when you feel you've floated far enough up so that you've lost all bottom contact and you're not hitting anything at all. Then resume regular reeling or sweep the rod tip until you start hitting stuff again. Repeat bumping and backing off until the lure gets close enough that the shortened line distance prevents your crankbait from reaching bottom any longer. Both the end of the retrieve (when the crankbait no longer reaches bottom) and the beginning of the retrieve (before the crankbait reaches bottom) are typically unproductive. A surprising amount of your crankbait's overall time/distance can be spent in the unproductive beginning and end of the retrieve. That's why a long-casting crankbait is desirable - to extend the middle part of the retrieve when the bait is in the strike zone. Other types of zone 2 and zone 3 crankbaits are not buoyant at all but are designed to be neutrally "suspending" crankbaits. They are precisely weighted so that they will hover and hold their depth when you pause the retrieve. Cast way out, crank them down to get them bouncing bottom, then pause the retrieve. They'll practically suspend and hover just off the bottom, rising very slowly if at all. At this point you should suspend reeling too. Rod manipulation comes into play now. Your mission is to find any manner of twitching, longer jerks or abrupt ripping that may trigger a strike - always with lots of pausing. Do whatever it takes with the rod tip to trigger that first response from the fish. Then repeat that over and over again, fine-tuning the "trigger key" you've found a bit better upon each repetition. That's called "catching" and not always an easy thing to do...but so very rewarding when you make it happen! Another use for zone 2 or 3 suspending crankbaits is where your electronics show bass suspended or feeding in the open water column. Cast far enough beyond the fish so you can reel the bait down to their water level. Same story here now. Hover your crankbait in mid-water amidst the suspended fish. Experiment with rod draws, twitches and generally using the rod to evoke that trigger response from bass at mid-depths in open water - always with plenty of lingering in-your-face pauses. I can't think of what else to say. That's basically it about crankbaits. Find the few that work for you and you'll never run dry of fresh water where you can throw them down and pull in a big bucket of bass!